Sadly, many myths about planned giving continue to exist. Some of these keep nonprofit organizations from engaging in gift planning. Others lead development professionals to make terrible, costly mistakes. All planned giving myths are dangerous. 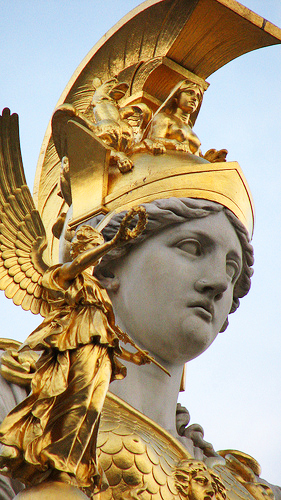 Statue of Athena, Greek Goddess of Wisdom. That’s why I believe that debunking common planned giving myths is important. In fact, I feel it’s so important that I addressed five of them in the very first chapter of my book, Donor-Centered Planned Gift Marketing. I’ll summarize them next week in Part 2 along with some other myths. For now, I’m going to share eight myths identified by the members of the Smart Planned Giving Marketers Group on LinkedIn. The remaining seven will be featured next week. Greg Warner, President of MarketSmart, started the Group which now numbers 577. If you have any interest in planned giving, you should join. MYTH 1 — The Estate Tax is a mandatory tax. MYTH 2 — My kids will resent me doing it. MYTH 3 — Age is an important factor in list segmentation. As Greg notes, while age can be an important secondary factor, the reality is that planned gift opportunities exist at every age level. For example, while it’s best to make a CGA appeal to older prospects, Bequests should be marketed to a broader age band, particularly those in their 40s and 50s. The points here are that while age is certainly of some importance, it is more important to recognize that the quality of the relationships is what is critically important, and that virtually everyone is a prospect for some type of planned gift. MYTH 4 — [You can] judge a donor by their outward appearance.